Planning on selling used cars on your website? There are very few good websites through which people can buy used cars, so it’s a fantastic niche for people to target. However, there’s a significant difference between popular advertising websites and ones where vehicles are sold. You will ideally want to create a platform that allows users to get comprehensive details about what they are buying, and makes it easy for advertisers to put up ads. Modern technology has now made it possible for virtually everyone to create their website and start using it to generate money. It’s an excellent choice for any person who wants to build their website but doesn’t have the skills for coding themselves. If you have created a website on the WordPress platform, you can easily choose from the thousands of themes available on the marketplace and install it on your site. However, many people are quite confused about which theme they should select for their website. If you want to create a site that’s focused on selling used cars, it’s imperative that you choose an appropriate theme. Using a theme that was initially tailored for online magazines is not a viable idea. You won’t get access to essential features that most people now consider ordinary in an advertising website. Thankfully, you don’t have to; the following article lists ten of the very best WordPress themes that were created primarily for selling used cars on your site. You can choose from any of the themes listed below and rest assured that all essential features will be included within. Automotive Car Dealership is by far one of the most prolific and well-designed themes for people who want to sell cars online. If you own a dealership and want to put your inventory online, this should be the number one theme on your list. Not only does it look perfect, but it comes with a plethora of different options and features that you can leverage to create a fully functional, well-designed website. 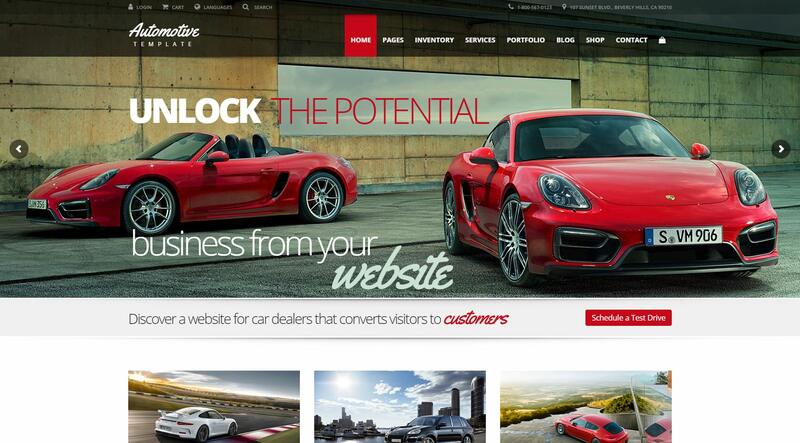 Automotive Car Dealership has customizable layouts, so your website will look completely different from anyone else’s. It is also incredibly responsive and can be accessed through any mobile device. Automotive Car Dealership is powered by the Visual Composer and comes with 32 PSD files. Along with that, the theme has filterable listings and a dedicated tool for inventory management that you can use as well. The theme gives you a variety of optional layouts to choose from, and also comes with pre-designed PHP contact forms that you can use too. The Visual Composer plugin, which is included within the theme, gives you unparalleled control over every aspect of your website. It also has the Slider Revolution plugin, giving you fantastic value. Of course, the theme is also RTL ready and can be translated into any language for complete localization. 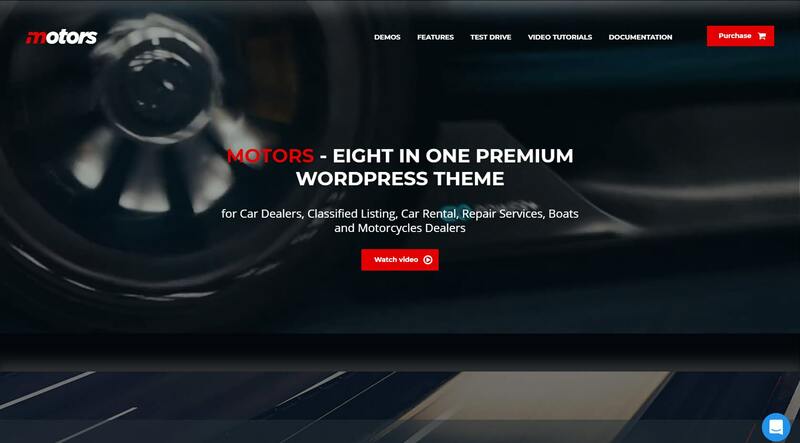 Motors is a great WordPress theme that is ideal for car dealerships, car rental companies, as well as for creating a platform through which you can just put up ads to sell used cars. The theme offers a variety of options, including DMS support, XML/CSV import options, and an advanced search facility. 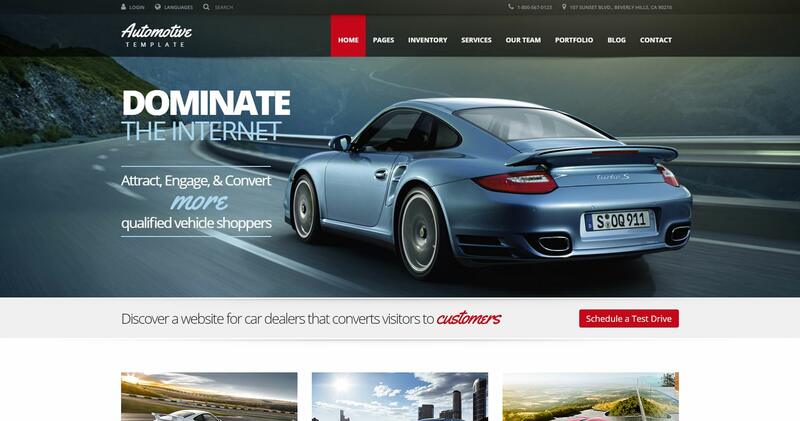 Motors is all about creating a fantastic website for your dealership online. The plethora of options that you get from this theme gives you enough control over every element on the site. It comes with a detailed video presentation that you can use to get acquainted with the features in the theme. The theme is marketed as an 8 in 1 theme, primarily because it can be used for classified listings, for car dealerships, car magazines, car rentals, and a lot more. There are built-in demos within the theme, so if you don’t want to build the site from the ground up, choose one of the demos and customize it accordingly. There is also a set of 4 customizable search options, and a dedicated set of filters that your users can take advantage of when searching for a particular vehicle. You can also choose between grid and list-based layouts according to your needs. Several cars selling designs are also available, and because the theme supports secure payments via PayPal, you won’t have a problem there! 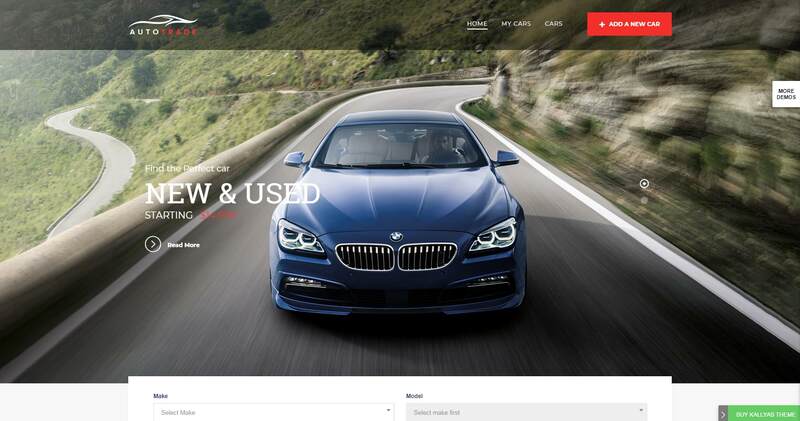 Auto Trader is a stunning WordPress theme that was designed for selling vehicles online. The theme is designed for classified listings and gives you a variety of different layouts that you can use when customizing the site. It is fully customizable, so no two websites based on this theme will ever look the same. You also get plenty of demos and additional features that you can use when tweaking the appearance of your site, making it a highly intuitive option for users. The website is fully responsive and retina ready, making it accessible from any device without any compromises in graphical fidelity. Images, texts, icons, graphics, and other elements can all be customized according to your wishes. One of the reasons why Auto Trader is so famous is because it gives you complete control over the admin interface, allowing you to change whatever you like about the theme. If you want to create a gorgeous online vehicle marketplace for your users, this is a fantastic theme that you can use. It looks good, works great, and best of all, has all the features that you could ask for! While it wasn’t initially designed for car dealerships and for selling used cars, Brooklyn can easily be customized for this purpose. It comes with 41 pre-built websites that you can choose from and then tweak according to your wishes. This is a huge plus, giving you fantastic options that are ready from the start. Considering the $59 that you pay for it, the value within the theme is immense. It can be readied in one click and also has 32 premade demos that you can choose from. There’s also a powerful admin panel and a separate tool for easy portfolio management. You can efficiently use the pricing table to set the prices for each car that you want to sell online. Apart from that, the theme is also translation ready and works very well via WPML. The theme also comes with additional plugins for free, namely the Visual Composer and the Revolution Slider plugin. It’s all customizable using simple drag and drop features, so you don’t even need any coding knowledge to make changes to the theme. 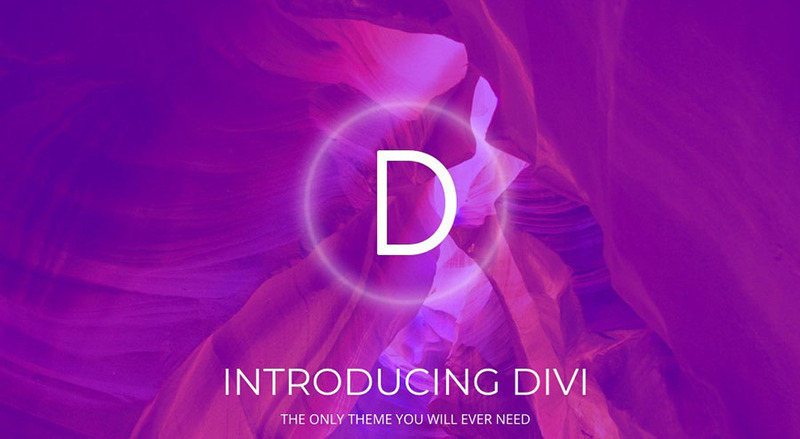 Often considered as the “jack of all trades,” Divi is an all-rounded theme that can be used in virtually any industry. If you want to set up a car dealership, it’s no surprise; you can also use Divi. You can build almost anything visually using the real-time designer tool that comes with the theme, and the responsive editing features within allow you to track your changes in real time. The theme comes with a plethora of additional features that you can use when setting up your site. Divi is packed with 46 unique content elements that you can use, while it also has an import and export functionality for adding new demos. It supports global elements and also has a live text editor. This gives you unparalleled control over your site, making it easy for you to edit virtually every aspect of the theme according to your wishes. You can even apply custom CSS animations in the theme if you want. Creatively designed by passionate developers, KALLYAS has become the number one choice for many people who want to create a website that’s focused on eCommerce. KALLYAS comes with some distinct features that are backed by a very robust and responsive support team. The theme is continuously updated, and new features are added regularly to the theme. The main draw of this theme is the fact that you can set it up within minutes, so building your website could not be any easier. KALLYAS has a potent visual builder that you can use when making changes to your site. You can drag and drop different elements from one page to another. On top of that, there are plenty of ready-made demos that you can choose from as well. A live text editor is also included for adding customizable text on top of each theme. Of course, the theme also has the Visual Builder built in that you can use when editing different elements on the site. 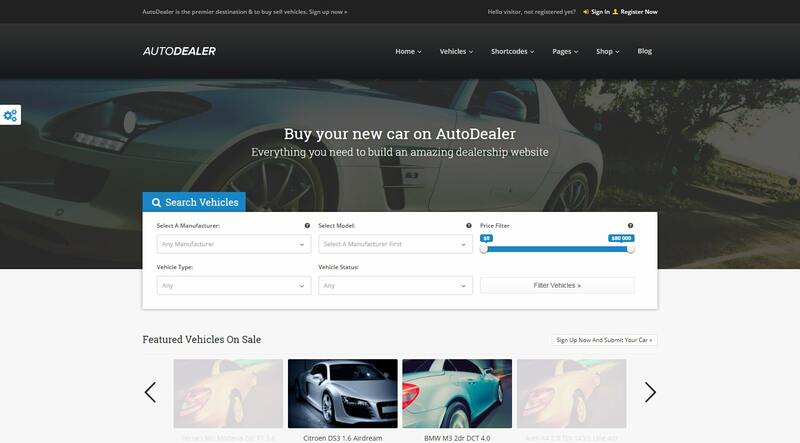 Automotive Car Dealership is a great WordPress theme that is ideal for car dealerships. The theme provides great value, especially when you consider the fact that it comes with additional sliders. There is a dedicated inventory management tool that you can use to update your inventory. The theme can be customized however you want, and the inventory search facility makes it easy for users to find the car of their choice. Automotive Car Dealership has a full blog page that you can use to update your website and stay in touch with your users. On top of that, the theme also has several ready-made layouts that can be used for enhanced customization. You can decide whether you want to go for a list-based design or wish to showcase your inventory in the form of a grid. Users can schedule test drives using contact forms, contact for more queries, or make a booking online a well. 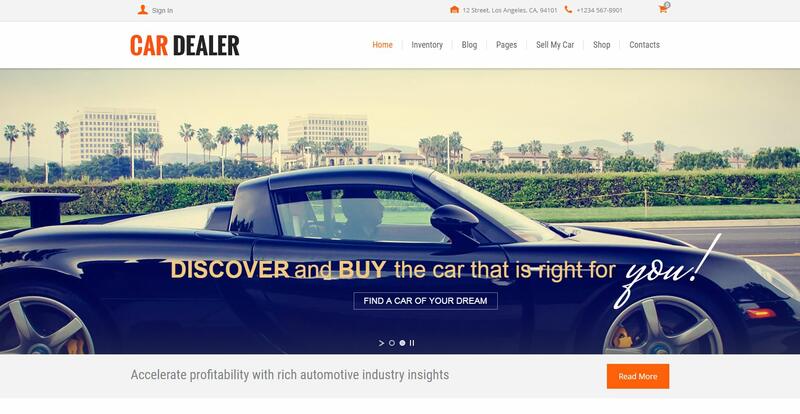 Car Dealer Automotive is a fantastic WordPress theme for people who want to create an online presence for their car dealership. If you trade in vehicles, you should consider selecting this theme for your website. The theme allows quick access to users and will enable dealers and sellers to create their profiles as well. Each image that is put up on the site can be automatically branded with your logo so that people will know which website it’s from. On top of that, the theme automatically pulls in the latest price lists and car lists from the theme, and a built-in loan calculator. You can put in sold and featured labels on the theme as well. Specially designed for car dealers and sellers, AutoDealer is packed with various features. It has a fantastic front-end submission system so that users can register, login, check their profiles, and make changes accordingly. It also comes with various layouts that you can use for your site as well. The theme supports WooCommerce so that you can get payments online as well. It also has dedicated payment packages and a favorites system that you can use when selecting separate ads. A built-in search system is also included for added functionality. Last but not the least, we have Redline. A fantastic theme for managing your vehicle inventory and providing users with a fantastic layout that they can customize according to their wishes. The theme is also fully responsive and looks great on any platform. 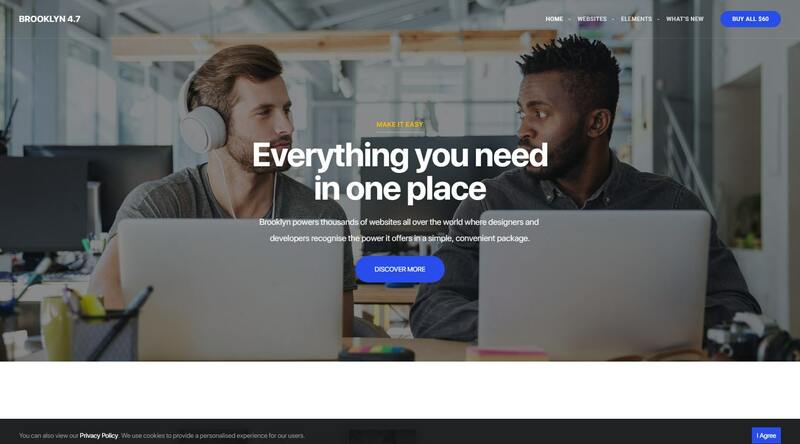 Engage one-on-one with your users with the help of this theme. It has a variety of great features and comes well-equipped with front-end and back-end support tools. The theme also supports the car dealership WordPress plugin and also has an easy search option. It provides complete dealership functionality to the users, and you can also change the layout and the background as you please. On top of that, the theme also comes with a detailed help file that you can go through to get a complete idea of all the different features that are incorporated within the theme.